I bake a lot of bread, as you’ve probably noticed, but I’m just a novice … there’s so much to learn about turning the most basic of ingredients – flour, yeast, salt, water – into something so elemental and elegant as a loaf of bread. I have a long way to go, and this is a large part of what draws me to bake bread. It’s a process that’s never finished. None of this stops me from searching for that perfect loaf, that fortuitous combination of ingredients, technique, environment and luck that leads to a truly outstanding loaf. I’ve been close a few times, and it’s true that the general standard of my bread nudges gently upwards the more and more I bake, but the self-critical part of me isn’t satisfied, and I doubt it ever will be. Good books help, and I’ve bought many. My bread making canon includes the superb River Cottage Handbook dedicated to bread, the best tenner an aspiring baker will ever spend, Daniel Leader’s Local Breads for everything European, the frankly beautiful Tartine Bread, and now Dean Brettschneider’s Bread. This is a compact list of dependable books, and it’s rarely added to. Brettschneider’s book is the first new one on there in years. The key reason that this book made the list is that it’s easy to follow. Some bread books present bread making as a dark art, shrouded in mystery, some sort of otherworldly alchemy beyond the reach of mere mortals. Others just make you work hard to get to the right place – Tartine Bread is one of those, a stunning, absorbing, captivating book, but tricky to actually cook from … I ended up transcribing recipes from it and stepping through them in a way I knew I could easily and simply follow. The results were astonishing, but the journey hard. Bread has none of this complication, and it’s a better book for it. This is the book that’ll give somebody who’s already baked a little and wants to know more the boost they need, clearly explaining techniques and processes and exercising them in a series of interesting and dependable recipes. 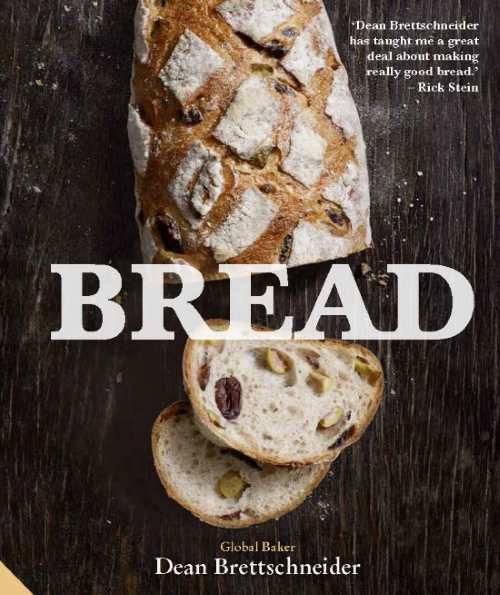 The chapter on ‘Bread Know-How’ is the single most accessible and well-informed piece of writing on the start to finish process of baking a loaf of bread that I’ve read in many years, and it helped to ‘click’ a few things I’ve struggled with on and off right back into place. I’ve baked about half a dozen breads from this book, including a stunning rye and caraway loaf that was remarkably easy to pull together, and some lovely baguettes studded with beetroot. I’ve also done a couple of other rye recipes in a broadly Scandinavian or German style, dense, heavy and complex breads, one of which was studded with chocolate. All were good, all were a diversion from the normal 600g of water, 1kg of flour, 15g of salt and 10g of yeast standard white loaf I bake a few times a week. A loaf like that is included in Bread, of course, along with a few other standards like a decent sourdough and a few baguettes, but it’s where Brettschneider takes these basic techniques and develops them further, dipping into other baking traditions that things get interesting, leading to things like bread rolls made with dark beer, walnuts and cranberries, or a sourdough loaf with a wheel of brie baked into it. These are recipes that take things up a level, that provide something to aim for, some new combinations of flavours that challenge and move things on a little. I don’t need many excuses to add to my collection of cookbooks, but there are only a few that see regular service. This is one of them.